Home > Dot Coms / Internet > VerticalNet, Inc. 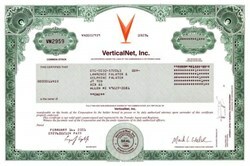 Beautifully engraved certificate from the VerticalNet, Inc. This historic document was printed by the American Banknote Company and has an ornate border around it with a vignette of the company logo. This item has the printed signatures of the Company’s President and Chief Executive Officer and Secretary. Verticalnet is a leading provider of Collaborative Supply Chain solutions that provide unmatched visibility into critical data allowing organizations to communicate, collaborate and conduct commerce more effectively across the extended supply chain. With Collaborative Supply Chain applications including Strategic Sourcing, Collaborative Planning, and Multi-tier Order Management, Verticalnet offers the broadest integrated supply chain solution delivered through a superior multi-party collaborative platform. Differentiated from enterprise centric solutions, Verticalnet's Collaborative Supply Chain solutions deliver its market leading customers the opportunity to drive significant cost reduction and top-line revenue growth by enabling them to harness opportunities for enhanced visibility, comprehension and response across their supply chain. Verticalnet's solutions are uniquely differentiated by its private hub architecture, enabling customers to manage diverse communities of suppliers and buyers in a secure, enterprise controlled environment while providing multi-party data integration and a proven ability to support role-based security. 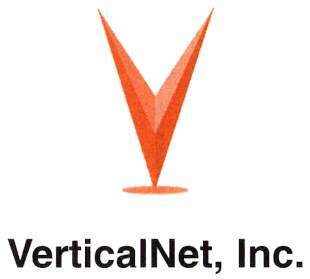 Founded in 1995, Verticalnet has pioneered the way businesses leverage the Internet to streamline business and maximize trading opportunities through collaboration.